A new cast has just been announced for award winning In The Heights which is running at the King's Cross Theatre until 30th October. 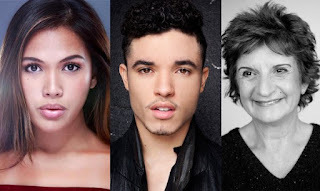 From tonight Christine Allado (From Here to Eternity, Here Lies Love) replaces Jade Ewen as Vanessa, Norma Atallah (The Sound of Music - Live) joins as Abuela and Jonathan Bishop (The Lion King) is Graffiti Pete from 15th April. Kimmy Edwards (Memphis) and Ryan Reid (Shrek The Musical) also join existing cast members David Bedella, Josie Benson, Vas Constanti, Lily Frazer, Sam Mackay, Sarah Naudi, Joe Aaron Reid, Cleve September and Philippa Stefani with Jocasta Almgill, Courtney-Mae Briggs, Michael Cortez, Gabriela Garcia, Reiss Hinds and Spin.